The simple answer is…yes. 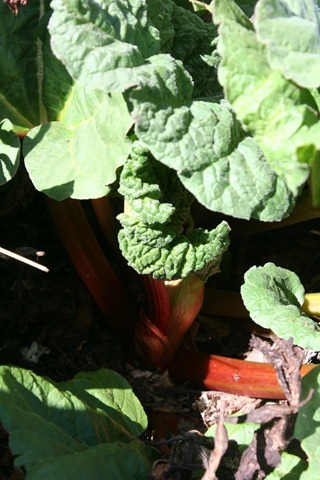 This cool spring has resulted in rhubarb, rhubarb, rhubarb. My rhubarb patch is in over drive. I have made, not necessarily in this order, rhubarb pie, rhubarb tarts, rhubarb chutney, rhubarb squares, rhubarb vinaigrette, rhubarb stew and stewed rhubarb. My mind harkens back to a hot day last June. I remember a simple rhubarb recipe from a book by Anne Gardon entitled “Preserving for All Seasons”. Rhubarb makes a surprisingly refreshing summer drink. Now this is what I call a rhubarb recipe – 12 cups of rhubarb. Red rhubarb should be used for this recipe – green and/or green stalks make for a rather muddy looking drink. It should be a pretty pink. I add a splash of raspberry vinegar to brighten the flavour. 1. 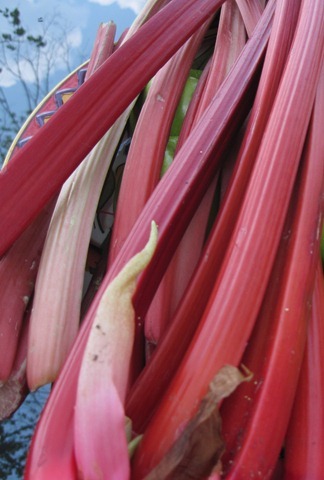 In a large saucepan bring rhubarb and water to a boil. Reduce heat and cook until soft. 2. Drain overnight in a jelly bag or a sieve lined with cheesecloth. In the morning feed the pulp to the chickens and measure the juice. Add enough water to make 4 cups. 3. Combine juice, mint and sugar in saucepan. Bring slowly to a boil while stirring. Cook for 5 minutes. 4. Remove mint, add vinegar and cool. At this point the juice can either be kept in the fridge or frozen. 5. To make a drink: add 1 ounce (or to taste) rhubarb juice to a glass and fill with sparking water and ice. Add a fresh sprig of mint. I am wishing I was around to sample the rhubarb pie, rhubarb tarts, rhubarb chutney, rhubarb squares, rhubarb vinaigrette, rhubarb stew and stewed rhubarb..! I am off to search for 12 cups of rhubarb! !